By now, you've all been exposed to the new Salesforce user experience branded as Lightning. However, many of you are wondering if this really matters to you. As with most decisions, the answer is...it depends. Listed below are some of the criteria to help clinch the decision if a) you need to take action for your app yesterday or b) you have the comfort of waiting until Spring 16 (or beyond). Do you upgrade to Lightning now or later? If you would say yes to these questions, you should probably jump on the bandwagon and make sure you're upgraded ASAP. Is your app targeted to core CRM users? ie Lead, Opportunity pipeline? Does your app have Visualforce components embedded in standard object detail pages? Is much of your functionality built into list view buttons? Will having this icon draw in more customers? If that's you, it's not too late, but let's get started. I think it will be a longer transition for much of the crowd out there. Most of ISV app users that we love do a lot more with the platform than just core CRM and will be a bit slower to adopt. Start by getting comfortable with the styling and begin to adopt some of the design principles of the Salesforce Lightning Design System (SLDS). 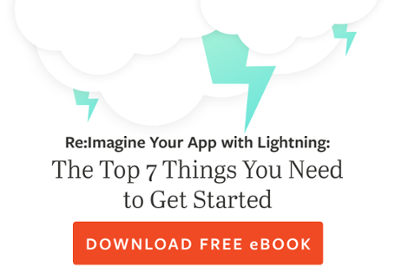 Get familiar with Lightning Components if you haven't already and lean towards those as opposed to building the functionality out in Visualforce components if possible. Also, prepare for left-hand navigation and a more SPA-centric experience for your app. The world is already mobile-first and you have to be responsive.What's coming Spring 16 and beyond? Salesforce is slow to show their hand at what the roadmap looks like. Safe Harbor applies per usual, but it appears they'll start doing more of the heavy lifting for us starting in the next release with some re-styling and re-branding of more and more out-of-the-box features. For instance, the SLDS will be built into the platform instead of you having to worry about constantly upgrading to the latest static resource version. For additional reference, take a stab at this Trailhead and review some just release documentation from Salesforce. As always, if CodeScience can help in any way, let us know! We've already gotten several partners through the certification process. Are you next?